076 – What Would My Life Be Like In Korea? Kim is a Korean born adoptee raised in an all-white community. She shared how she always pushed down her desire to search for her birth mother until the recent political climate brought out the true colors of her adoptive mother. I’ve heard stories of Asian adoptees having trouble making connections overseas, but Kim’s connection was quick and easy. But building a relationship through a translator, secrecy, and secondary rejection have left Kim with a broken heart. Kim: 00:06 And we look very, very much like really? That was very emotional for me because growing up in a place where there weren’t a lot of other Asian people, I had no idea what I was going to look like when I grew up and now to see some existing in the world, he looks nearly exactly like me is wild. Voices: 00:35 Who am I? Am I am I? Who am I? Who am I? Who am I? 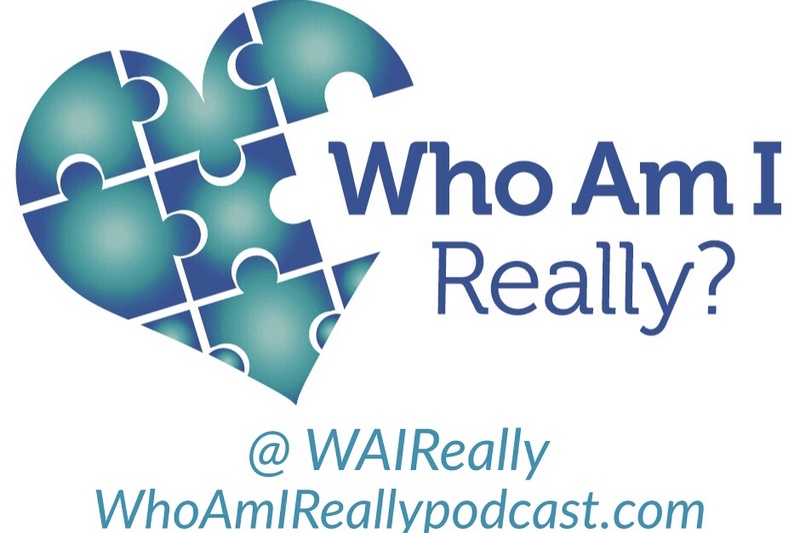 New Speaker: 00:47 This is who am I really a podcast about adoptees that have located and connected with their biological family members. I’m Damon Davis, and on today’s show is Kim. She called me from right here in silver spring, Maryland. Kim is a Korean born adoptee, raised in an all white community. She shared how she always pushed down her desire to search for her birth mother until the recent political climate brought out the true colors of her adoptive mother. I’ve heard stories of Asian adoptees having trouble making connections overseas, but Kim’s connection was quick and easy. But building a relationship through a translator, secrecy and secondary rejection have left Kim with a broken heart. This is Kim’s journey. Damon: 01:36 Kim was adopted from South Korea when she was five months old. Kim: 01:40 I came on a plane to New York City with a military personnel who is carrying me. And so that day, um, my family celebrates as an airplane day I think and that I commentator his Gotcha day and so really celebrate that as like when I joined the family are like our family became complete. Damon: 02:07 Kim grew up in Toms River, New Jersey with her brother, nonbiological also adopted from South Korea. Kim is from Incheon and was adopted through Spence Chapin based in New York. Her brother was born in Seoul and he was adopted through Holt International. Kim said there were very few other Asian people in New Jersey and even fewer adoptees that she knew of. Kim: 02:30 My adoptive parents did put a lot of effort into trying to educate me, I guess about being adopted and they did make an effort to try and connect me with other adoptees through support groups or agencies sponsored camp. It will say like, I am grateful that I was adopted through Sepnce Chapin because they do have a great, a close adoption services department through their agency, some of the people that I’ve worked with that are adoptees themselves, so that is a great, uh, resource, the barrier for me to access information, especially regarding my birth family and like my files Spence Chapin made a very easy and talking to my brother apparently when he tried to find out information about his birth family, it was a less straightforward. Damon: 03:31 Yeah, I’ve, I am not an international adoptee, but in the little experience that I’ve had in speaking with international adoptees, it’s been my understanding that the process can be incredibly challenging to try to search anyway just because, you know, there was this churning market for, you know, the, forgive my words, the removal of babies, the placement of babies and I’m just, there was no need for any kind of documentation. We were moving these babies along and it wasn’t seen as an a time to, in any way retain somebody’s identity. You know, there was really just a market for moving children into their next family. So That’s interesting that they made your records so openly available. And that’s cool. Kim: 04:21 Yeah. So, you know, it kind of gave me some I comfort in that I feel like my birth mother perhaps wasn’t afraid to find me or like search for me later in life because she did leave her real name and she did provide my actual birthday, which had a lot of adoptees don’t have birthdays. They have to be there, the date that they were released from the orphanage or foster care but don’t really have an idea of when they were born. And like you were saying, you know, there was such a market and people forget that adoption is a business. Damon: 05:08 It can be very expensive to adopt internationally. And Kim commented that she wondered where these exorbitant fees are going and who’s profiting. So growing up it was pretty obvious that Kim was adopted. She talks a little bit about the comments she heard and her first indication that she was truly different than other children. Kim: 05:28 My parents are white. Um, and people would always ask very blunt questions like, did you know you were adopted? Or like when did you know that you were adopted? Like, how does it feel to know that your parents didn’t want you or how much did you cost for your parents to bring you here? Don’t you feel so grateful to them for saving you from Korea? So I remember the first time that I felt my race and I just didn’t know how to handle it was when I was five in kindergarten and people were like pulling back on their eyelids to me because at that time there was a black boy in my class and myself and we really diversity in the entire grade and, and so, you know, kids can be just so cruel and I just remember being like, oh, like someone was thinking of the way I worked and I was like, well, they’re just being ignorant and prejudiced and she never used the word racist. Even in other instances in my life when I experienced racism or prejudice and eventually it was a huge falling out for us are the way that we see and experience the world in different ways. Damon: 07:06 Right. I can remember being that age in acting that way towards any kid, but I definitely can relate to being on the other side of what you experienced and I’m really sorry for that because that is racist and it does alienate people and you know, at fifth grade like you shouldn’t have to worry about that kind of stuff. Damon: 07:30 I keyed in on Kim’s comment that the different ways she and her mother experienced the world turned into a rift between them. She said the challenge of dealing with her mother’s political views were part of what drove her to search. Kim: 07:43 I actually first started looking for my birth family when I started having issues with my mom and it mostly came about from the recent presidential election and it just the stark difference in political views and social and moral values and I just felt like we were so different and things that were just very obvious to me in terms of like human rights and moral compass. We were like polar opposites and I just felt if I didn’t feel like physically different or as like an other category. From the way I looked, this definitely made me feel uncategorized I guess in my family, just like completely outside. I just felt like, how can I be so different and have such different views about society in the world that we live in? Damon: 08:50 May I ask two things? So first, what did your brother feel? Kim: 08:58 Uh, so my brother and my parents never got along well. I think a lot of that stems back from his adoption story. He actually had a foster family and Korean and I was in an orphanage. And so, during those very young, special years, he was able to connect with someone. Damon: 09:20 No, I understand what you’re saying. I’ve got, I have experience with that. Not Myself personally, but my own daughter has that very same. Does the attachment issue. She came to live with us when she was nine, so you can imagine that she was very, very attached to the life that she grew up in. So I understand what you’re saying in terms of an inability to have a, to overcome certain attachment disorder issues to people. So what then did your mother try to explain to you and you know, often when people have these differences of opinion, you get into an argument, right? You want to persuade the other side why they are wrong and you are right. How, how did that play out? Not necessarily politically, but in terms of what you gleaned from how she was expressing her views of the world. Did you come to the realization like, oh, this is how you were raised or, or this is like the sixties in which you were raised or, or whatever the thing might be. What did you glean from your conversations with her about that? Kim: 10:26 Yeah, I think a lot of it is how she was raised. Very much so, and a circumstance with privilege. Uh, but I’m one of the things that she had shared with my husband. She explained that I should be grateful because if she had not brought me to this country, I wouldn’t even have the ability to vote that I should like allow her to express her, own feelings and express her own opinion and whatnot. But I was just really taken aback by this idea that the saviorism and how I should be eternally grateful, like she provided the opportunity for me to vote. Damon: 11:17 That must’ve been hard for you to hear. Especially because she said it to your husband. Damon: 11:24 This is behind your back conversation. Damon: 11:29 It’s pretty clear. Kim has a deep disdain for her mother, but I hadn’t heard a single word about her father speaking about him. She did not bite her tongue. Kim: 11:38 he, I think is a terrible human and he is a abusive alcoholic. I don’t think he was ready to be a father let alone ready to parent children of another race. And ultimately my parents divorced when I was 14 at my recommendation. Kim: 12:06 So we don’t talk at all. Kim: 12:46 Oh, that’s so great, we are your family. So when we had these pretty big fight, then we’re thinking about the world in a very different way and it’s like, well, maybe there’s someone out there whose opinions and decisions that are more in line with mine. Damon: 13:04 Kim reached out to Spence Chapin post adoption services to see what her options were. She had low expectations because she heard so many stories of prolonged unsuccessful searches, but her case was a quick turnaround. In March 2017. She reached out and a month later she was reading documentation from her orphanage in Korea. Kim: 13:25 So I was able to read some backstory who my birth mother was like a milestones that I had in the orphanage. LikeShe’s kicking and moving across the crib with her leg. Like she is like not crying anymore. And then I received a letter from my birth mother as an attachment in an email. Damon: 13:49 Wow. Do you recall, before you get into the letter from her, do you recall what the file said about her and who she was? Kim: 13:59 Yeah. So she was 16. So in Korea you’re born one year old and then add on the new year. Everybody turns another year, older so into the filed. So she’s 16. So it’s possible that she was only 15 when she had me. She had run away from home and while like while she was away, became pregnant and came back and some of the language is in the file is pretty funny, I guess like humorous to me, uh, the cultural differences because they’re very scornful shaming the language than they did when they describe her situation. “And then this person returned shamefully to her parents and like begging for their forgiveness” and da da da. Damon: 14:57 Oh, they injected their own judgment onto her situation. Wow. Kim: 15:02 So it was, that was interesting to read. I’m like, oh, this doesn’t really seem relevant to my case. Damon: 15:08 That seems like a little bit of editorial commentary there. Kim: 15:11 Yeah, I just, uh, never, I wasn’t expecting a letter from that. I was pretty shocked when I saw that. Damon: 15:18 Yeah, I’ll bet. What is her letter say? Kim: 15:21 She asked me for forgiveness, uh, because she was sorry that she put me up for adoption and she said it was one of the greatest regrets of her life and then she ended up adopting a son to atone for her mistake and then she has a biological daughter now in Korea. Damon: 15:47 Wow. What did you think when you saw that? Kim: 15:50 I, I was pretty hurt that uh, she would put me up for adoption and then not too long after adopt a son in Korea. Kim: 16:08 yeah, like on the one hand that I guess I can see that, you know, clearly she was sad in giving me up, but at the same time edits here, like, you know, it was only, he’s only a year, a year or two younger than me. I’m just like thinking oh what if she had to held onto me for the year. What would my life be like growing up in Korea? Kim: 16:45 I just thought it was so cool to potentially have more siblings out there in the world, especially to have a half sister. Kim: 16:58 nobody knows about me and she’s like, I’m sorry I didn’t start looking for you before you found me, but she’s like, I never forgot about you. Kim: 18:03 and we look very, very much like really and that was very emotional for me because growing up in a place where there weren’t a lot of other Asian people. I had no idea what I was going to look like when I grew up in now to see some existing in the world. He looks nearly exactly like me is wild. Damon: 18:27 Yeah. I can imagine. I mean you grew up in a predominantly white, an all white community it sounds like, and then to see a photo of somebody whom you clearly are descendant from, that must have been huge. Kim: 18:41 Definitely. I thought like she is almost like a mythical creature that as a young kid he make up stories about why you were put up for adoption or like what their circumstance might be like, what my thing look like, and then to see a picture, see, wow, this is a real person and you can definitely see that we are related. Damon: 19:07 Really cool. Yeah, that is really cool. Damon: 19:43 from across the world. Kim: 19:45 Yeah, I mean she doesn’t even want me to come to Korea because I think it’s definitely a source of shame or like a secret history that she doesn’t want exposed and so people always ask me if I’ve been back. If I’ve done any of the homeland trips, then I just feel like that the country that sold me away so I don’t have a strong desire to go back. Damon: 20:14 That’s interesting. You do. You feel a connection to the coast, so I guess what I’m wondering is as you stand here on this soil, having come from people who don’t look like you and you look back across the water to a country full of people who do resemble you, but you have animosity towards at least the organization that sold you away. Where do you find yourself in the middle of that? Kim: 20:43 I think like many other adoptees in this “other” space where you don’t really connect to the culture or your adopted from either. Like I don’t speak the language, I don’t know like cultural, social habits there and even if I were to go there, it’s pretty what I’ve been told by other folks. It’s pretty obvious that I’m American, but then here a lot of times you don’t really feel welcome either. Damon: 21:22 In what ways? Kim: 21:24 I think that a lot of the language around immigration right now, talking about people who aren’t born here, like I wasn’t born here, I was naturalized as a citizen very young and a lot of adoptees are still on documented. They just see parallels in my story like what’s going on in the nation today. We’re trying to create like very hard categories. Like you can check boxes and stay here and who cannot. Damon: 21:58 Yeah, I could see how that would be a hard thing to ignore. It’s very, very front and center and I’m sure if you’re looking at the news reports and listening to pundits and all kinds of things you’d think to yourself, well, if they’re saying that about them, then what are you saying about me? Right, exactly. First I should pause and say, I’m sorry. I feel really badly that a country that you’ve grown up in and you know, were brought here to be a part of doesn’t necessarily feel like a welcome place and I feel really badly for you and anybody else who feels that way. That’s… I mean I can say the same thing because you know, the racial tension that is a prison yet again is really challenging for me to watch as well and you really do want to fight and resist, but I feel something different than I think you do. Damon: 23:05 They may be in a similar, you know, racist bucket, but I don’t, I don’t personally feel like someone is trying to eject me from the country and I, I get the feeling that that is more what you can relate to and I’m really sorry for that. Kim: 23:49 and then anytime I try and reengage and be like, oh, you must miss me. Like of course like I haven’t had a birthmom my whole face and it just seemed like every time she was almost annoyed or didn’t have a space to talk to me. Damon: 24:10 It sounds like because she held you back for as a, as a secret for so long and there was so much distance between you and almost sounds like there was no requirement to connect. There’s no need on her end. Right? Damon: 24:31 like she’s checked the box on figuring that out. Damon: 24:35 I think about, you know, some people I’ve, I’ve spoken with other adoptees who just shown up on someone’s door and uh, or who, you know, finally write the letter that they’ve wanted to just pour their emotions out in. But I feel like you are trapped from doing either of those things either, you know, between translation and geographic boundaries that prevent a surprise trip that would just say, hey, I just wanted you to see me. Like you really, I feel like you’re confined in so many ways, let alone her own emotional barriers from letting you in. Is that right? Kim: 25:13 Definitely. But at the same time I’m pretty lucky to have received the picture. I like to know who she is, and that she exists in the world. Like so many people start these searches and like don’t any relation that sometimes I wonder if it would be better to not know. Damon: 25:36 I was just about to ask is it, is it more torturous to be where you are now than to have had forgive my term, you know, the blissful ignorance of not knowing anything. Kim: 25:48 I don’t know. I think about it a lot. What’s really hard for me is like compliment you or like a very kind thing and it they say think back to like, Oh, other people see the things that I can do and like know me as a person. But still my birthmother doesn’t want to know me and doesn’t care, and won’t ever take the time to learn those things about me. Damon: 26:24 Kimberly’s already told us that her contentious relationship with her adoptive mother was a part of the spark that ignited this search. So I asked if she shared her search journey with her adopted mother. She told me that she did and her mother was upset that she didn’t include her in the search process and that Kim didn’t want to pass on her birth. Mother’s contact information. Kim: 26:44 Like, it with my birthmother. Right. I just wanted to have something to myself. Kim: 26:57 Yeah, just one thing I want to keep to myself. Damon: 27:01 So where are you with her now? Kim: 27:04 Um, We’re not speaking right now. Damon: 27:06 How long has it been? Kim: 27:10 Maybe a few months, or so I like just totally stopped. Damon: 27:15 So who do you lean on now? New Speaker: 27:24 Yeah, he’s a gem. He, he’s been spending a lot of time educating himself about issues and the community as a whole. Damon: 27:36 Yeah. It was going to ask you. Yeah, that’s, that’s hugely important because I’ve spoken with other people and some folks have just said, you know, my spouse was like, whatever, everybody goes through something, get over it, you know, like just incredibly insensitive and, but not even as much the insensitivity as much as not even a glimmer of an attempt to try to understand. Right. And I think I’m, oh, I’m frequently talking to people about empathy and trying to understand what someone else’s situation is before you say “Nag, get over it”, right. At least try to try to get it. And the fact that he’s educating himself to try to understand is huge because you can’t empathize at all if you haven’t gone through that exercise. Kim: 28:29 Definitely, and it takes a lot of legwork off of me because he’s actually actively doing some research or like finding articles, listening to stories like, on his own rather than leaning on, he’d be like, can you teach me this whole thing? Damon: 28:47 Yeah, right. You don’t have to be the professor of adoption. He’s basically doing some self…he’s Self taught in some ways educating himself. That’s really good. What’s his name? Damon: 29:02 as we talked, I couldn’t help thinking that there was an alternative to finding a link to her. Half sister folks have found some circuitous routes to locate and connect with their biological relatives, so I wondered if Kim ever tried to locate her half sister’s social media profiles. Kim: 29:20 I’ve actually been seriously considering I’m seriously considering participating in a nonprofit organization called 35 Kamra and they distribute the ancestry tests in Korea and pair them with a kid so you’re more likely to find matches and I think you know, she and my brother are millennials, like they could be interested in participating in this tech that. But the circling back to like social media that I can’t write or write or read Korean so I wouldn’t even know how to search for her birth mother won’t even give me their names. Damon: 30:03 Man, you’re trapped from every angle. That’s crazy. How are you doing now? This has been a lot and it happened quickly. It sounds like to how. How are you? Damon: 30:31 Kim works with adoptees and is building a suite of resources. She says it’s hard to offer any piece of herself as raw as her feelings are while focusing on the adoptee community she’s serving. I asked about Kim’s interactions with the community. Damon: 30:47 What do you feel when you talk to other people about their journeys and in through the work that you’ve done? Kim: 30:54 Um, so I typically don’t share my story, what I’m working with adoptees or hosting studios from listening to other people’s stories. I don’t do well balancing here’s being like, let me also try and focus on you. Like I will just present my attention to the group that I’m working with, but there are definitely a lot of shared themes, shared feeling, a shared experience and that we all have. Damon: 31:26 Do you want to say anything about your, the work that you do at all? Kim: 31:31 Sure. So I’ve been working with international and domestic adoptees to explore how folks are using the commercial ancestry kits and we’re looking to create educational resources. So like when you have questions before or after you participate in one of those things we fill in the information gap. If folks have questions about how the tests work, questions about your privacy, questions about your identity, there are resources for that and I just think it’s really timely to get the information out there and increase literacy. It’s national adoption month in November. It’s just a transformative time to be where We can just mail out da for testing. Damon: 32:22 I know, I know. You have. Could you have guessed that you would reach this point? It’s just an astonishing, astonishing set of developments. I’m glad you’re doing that work and I hope you take some fulfillment out of it too because you know, given the arc of your story, I would imagine it probably feels good to back a little bit. Damon: 32:40 Is that right? Kim: 32:41 Yeah. The adoptive community has been a source of support for me. If I can get back in some way, it makes me feel good that. That’s great. Damon: 33:04 Hey, it’s me. I admit, I paused to think about how different Kim’s life would have been had she not been adopted. I think about it with every guest I speak with, but there was something about imagining her being kept by her mother instead of the woman adopting a young boy growing up in Korea instead of New Jersey and being surrounded by people who look like her instead of standing out, so obviously in her community and to top it all off, I thought about what it would be like to be a native to Korea instead of feeling for there and here in the United States and it hit home how alienating adoption can be for international adoptees separately. I was glad to hear that rob is doing the hard work to support Kim as she continues this journey. It’s incredibly hard for an adoptee to have a conversation with someone about the logistical and historical elements of adoption and then have to recap their own deep, hurtful feelings in order for their supporters to empathize. Damon: 34:05 It’s great that rob is educating himself so that he can really support Kim. Oh, and Fyi, the organization, Kim said, she’s thinking of doing dna testing, is is called 325 Kamra That’s k a m r a. Their website, three to five camera.org says they’re working to reunite Korean families separated by war, adoption, death, and tragedy. Of course, I wish him luck in making a connection to her sister. I’m Damon Davis and I hope you will find something in Kim’s journey that inspires you, validate your feelings about wanting to search or motivates you to have the strength along your journey to learn who am I really? 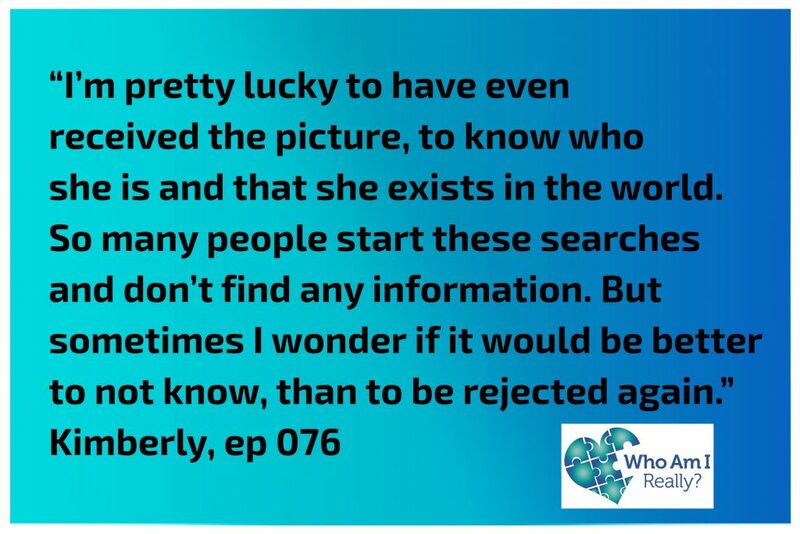 If you would like to share your adoption journey and your attempt to connect with your biological family, please visit who am I really podcast.com/share. You can choose to share your whole story, maintain some privacy about parts of your journey, or share completely anonymously. You can find the show at facebook.com/waireally or follow me on twitter @WAIReally, and please, if you like the show, you can support me at patrion.com/WAIReally, you can subscribe to who am I really on apple podcasts, Google play or wherever you get your podcasts and while you’re there, it would mean so much to me. If you would take a moment to share a rating or leave a comment, those ratings can help others to find the podcast too.